Sadly I heard about this just a little to late to check it out for myself, though I’ve yet to be able to find out exactly where this was setup, so I likely wouldn’t have been able to find it anyways. Apparently the folks from BC Hydro setup the billboard in a parking lot somewhere in downtown Vancouver. 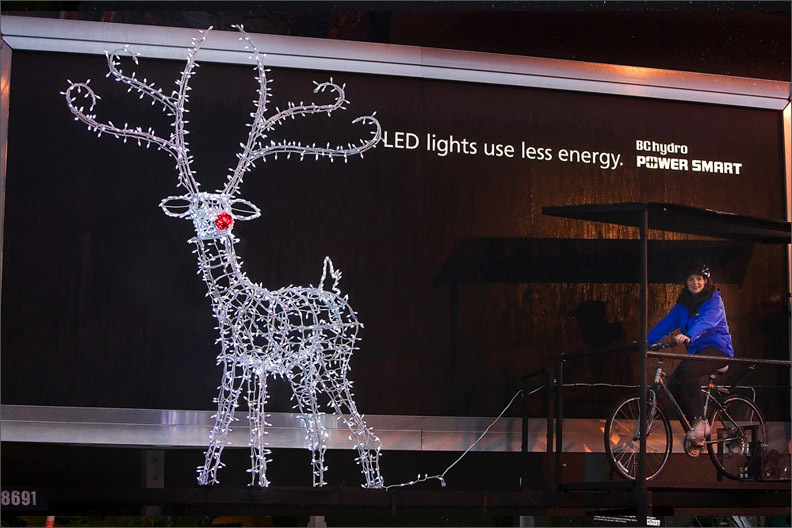 The billboard was up for 5-days and featured a reindeer encrusted with 1,500 LEDs, all of which were powered solely by people power! The DDB/Vancouver project required 120 volunteers to power the display, non-stop, for 5-days. BC Hydro says the power required to keep all 1,500 LEDs burning for 5-days would have been just enough to sustain 120 traditional mini Christmas lights for just as long. That’s a hell of a difference. One things for sure, 120 mini bulbs would have made for one skinny Rudolf. Richards just South of Robson. So, behind S’il Vous Plait? i wished i could have seen this thing too. I was curious about what kind of person would volunteer their nights sleep away for an advertising project!